This hollow vase was turned from a very unusual walnut log, which is rare to find with spalting patterns. This vessel stands 7 inches tall by 8 inches in diameter. Walnut is inherently a very dark colored wood - when Mother Nature starts an abnormality and it falls into my hands as raw material, it is difficult for me to not ruin it. It truly gives me an enormous amount of personal satisfaction in creating this piece from a log that was destined for the firebox. 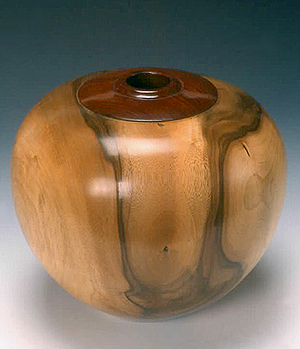 A cocobolo insert was added to the top, giving the turning more color, character and warmth.